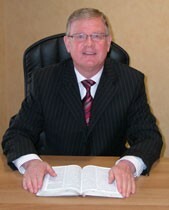 Denis Lyle was born into a godly home in Banbridge, Northern Ireland. His parents took him to the local baptist church and though its ministry he was brought to a saving knowledge of the Lord Jesus. As a young man he responded to the call of God to Christian service. Entering the Irish Baptist College in Belfast in 1972 he graduated three years later. On completion of his biblical studies he received an invitation to minister the word in Carryduff Baptist Church, just outside Belfast. There he execised a fruitful ministry for twelve years. In 1987 Denis began his ministry in the iron hall assembly on the east side of Belfast, pastoring the work for eleven years. In 1998 he moved outside Belfast to Lurgan Baptist Church, where as a teenager he had been greatly influenced by his spiritual mentor Pastor William Mullan. He is the author of four books. The Good, The Bad, And The Lukewarm,” the Seven Churches In Revelation. Countdown To Apocalypse, unlocking Bible Prophecy. Sifted To Serve, a panoramic study on the life of Peter. For the last twenty years Denis has been using his holidays to take christians on vacation to various parts of the world. Denis is married to Catherine a staff nurse and has two married children and one grandchild. Denis has had the privilege of ministering God's Word in Australia, South Africa, and Romania as well as conducting missions and conferences in his own country. He has an M.A. and a Ph.D. from the European Theological Seminary. He has also preached meetings in the U.S., and will be preaching in April 2009 in Memphis, Tn and Atlanta Ga. The addition and expertise of Dr. Lyles to the staff of CFEBP, greatly enhances the level and intensity of our homiletics program. We are pleased to have Dr. Lyles aboard.